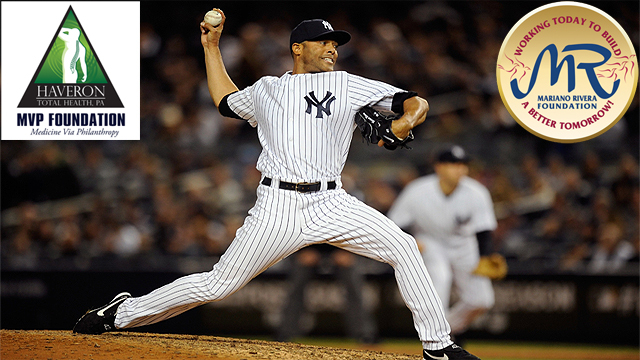 Trenton Thunder official chiropractor, Dr. Thomas "Doc" Haveron, announced today that the special guest for the Fourth Annual MVP Foundation Event on Thursday, August 7 at ARM & HAMMER Park will be New York Yankees legend Mariano Rivera. The MVP Foundation will present a check to Rivera and his family on behalf of his church, Refugio de Esperanza (Refuge of Hope), in a ceremony on the field before the Thunder vs. Altoona Curve game slated for 7:05pm. Rivera will also throw the ceremonial first pitch. "Mariano and his family have done so much for the community through the Mariano Rivera Foundation and through the restoration of Refugio de Esperanza," said Dr. Thomas "Doc" Haveron, founder of the MVP Foundation. "He was a legendary player, an amazing humanitarian, and a friend of the MVP Foundation and we're so happy he and his family will be part of this year's event." This is the third year that the MVP Foundation has held their annual event at ARM & HAMMER Park. Past special guests include Robinson Cano and David Robertson. In 2011, Dr. Thomas "Doc" Haveron (Harrison, NJ) founded the MVP Foundation (Medicine Via Philanthropy) which raises money for children with serious illnesses, provides scholarships for students to attend medical school and helps other non-profit foundations fulfill their missions. Learn more at http://www.mvpfoundation.net. The game on August 7 against the Altoona Curve will also include a post-game fireworks show presented by CareOne. The Thunder are on the road at Reading and will return home on Friday, July 11 to face the Akron RubberDucks (Cleveland) in a four game series. Tickets are available at trentonthunder.com or by calling 609-394-3300.